the first leaf. Kai Lossgott. 2008. 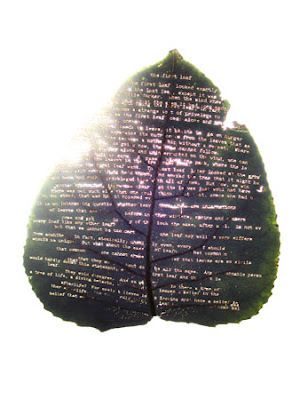 Typewriter on sycamore leaf. 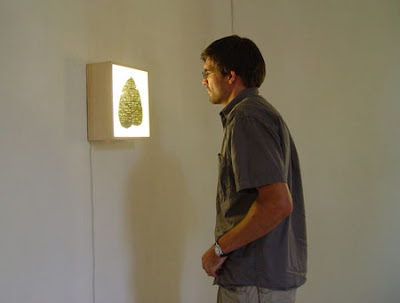 Spruce and glass light boxes. 30 x 30 cm. SASOL Art Collection. sound. Kai Lossgott. 2008. Laser engraving on foxglove leaf. Spruce and glass light boxes. 30 x 30 cm. SASOL Art Collection. neurotech. Kai Lossgott. 2008. Laser engraving on morning glory leaf. Spruce and glass light boxes. 30 x 30 cm. Private Collection. 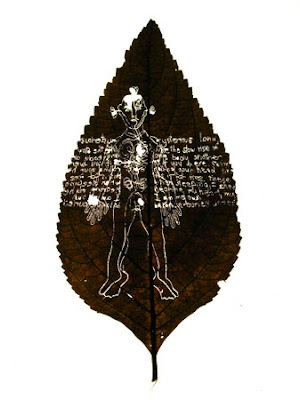 For South African conceptual artist Kai Lossgott's latest project, 'nothing with skin is blind' he has made minute incisions, punctures and impressions into the tissue of plant leaves to form texts and images which are only visible against the light. Displayed in lightboxes, the leaves gleam. One of the texts makes reference to "the inheritance of light". "Shoot," proclaims another, "in spring his heart / is open as a gun". Lossgott's work emphasises the shift from an anthropocentric to a biocentric position, from the human-centred to the life-centred. Most of the engravings are continuous line drawings exploring the sensory abilities of the human body. "We have certain features in common with plants," says the artist. "We develop in symmetry, with a form of skin, branches and capillaries containing blood or sap. We both perceive a diurnal and seasonal progression in the body. A plant perceives in the way human skin perceives. It scars, it heals. It remembers." 'Nothing with skin is blind' makes reference to cellular memory and engrams, a postulated biological change in neural tissue that represents a memory. 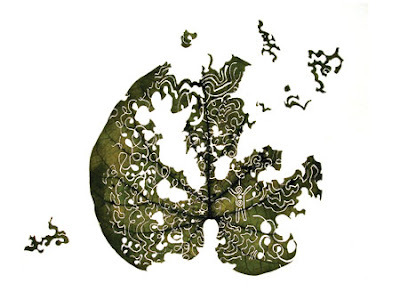 Plant, human or animal, the artist seems to say, our biological processes bear certain similarities. It is through these similarities that Lossgott draws into question the boundaries between different forms of sentient life and where exactly consciousness begins. 'nothing with skin is blind' was first shown at the Gordart Gallery in Melville, South Africa, in April 2008. The work has since been acquired by various corporate collections.